My coaching days started back with Team in Training. What a great group to work with! I won’t forget the first “race” I did. It was in Anchorage, AK and it was with my friend and her sister. I don’t even remember how far it was… I think it was 5 miles. Anyway, I just thought I could go out and run that far so that is what I did. Yep, I made it. Barely. I think the only reason I made it across the finish line was because I was young and participated in some sport-like activities. I might have even gone to the gym a few times a year. But I definitely paid for it the next day when I could barely walk. The next time I ran a race (many years later) I was obviously older and wiser. I knew I actually needed to go out and run a few times before the race. I remember that. I ran a few times on the flat roads and then I entered a race that required running uphill on a trail. I guess I still couldn’t get it right. Finally I decided to read a book (or maybe just glance through it). I figured that I needed to know a little more if I planned to run a half marathon. That seemed like a really far distance and I could probably hurt myself if I didn’t prepare correctly. Lucky for me, I had a running buddy to drag along and we somehow managed to haphazardly follow a plan I had read somewhere. That worked out pretty well. I finished the half marathon. Slowly, but victoriously! At one point I felt that the marathon was within reach and maybe I was finally crazy enough to get it done. Yet, I had no clue how I would get it done. I figured it probably wouldn’t be a good idea for me to just wing it or even follow a free plan I had downloaded off the internet. That is when Team in Training entered my radar. Well, actually they had already been well within my radar because I did a Grand Canyon hiking event with the Team back in the day before I became serious about running. I knew that they trained people for marathons too. I wasn’t nervous about raising the money because I had done that before, so I thought it might be a great way for me to get the help I needed. I met them at the very first meeting. The coaches. They were so full of life and excited about helping me to get to where I wanted to go while helping out a great cause in the process. I left the meeting energized and ready to get started on accomplishing my goal of running my first marathon. The Team in Training coaches wrote plans, organized runs, provided advice and handled the logistics. Most of all, they offered support, encouragement and motivation. If I was feeling down or weak, they would lift my spirits and point out my strengths. If I was feeling unsure, they would encourage me to push through and reap the rewards of new challenges. I always felt like I could do more than I ever thought possible. Sometimes I took it too far and my coaches had to help me pull in the reigns. Coaches are all about the checks and balances. I was so inspired by my experience with the coaches that I decided to become a Team in Training coach too. It was truly a reward to watch my group cross the finish line. I held on to that feeling for a while until I decided to make a serious change in my life that involved the start of my own business: Inspired Miles Coaching, LLC (www.inspiredmiles.com). On occasion, I have been asked “why would someone need a running coach?” That is a good question and I think I have an answer. Never ran before? Or has it been awhile since the last time you went for a run? A coach can help you get back on track by helping you develop realistic goals and providing guidance on how to reach those goals. Maybe you have been previously injured and need help improving your running form or finding exercises and running drills that will make you stronger. What about that half-marathon or full marathon goal? Do you know which path has the least resistance or will you run blind and risk encounters with injuries, over-training, time constraints, disappointments and other setbacks? It is hard to know what to do if you don’t have the necessary experience. I was there once. 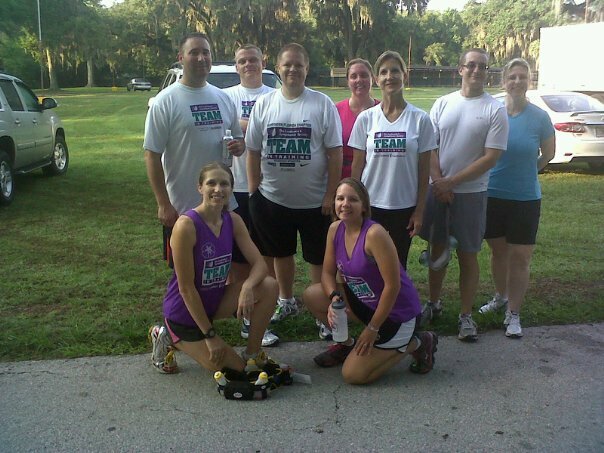 It took me awhile to navigate the sport of running and my Team in Training coaches helped me to feel more confident. Knowledge is valuable, but it is just as important to have someone there to keep pushing you in the right direction. Tim Noakes (author of the Lore of Running) points out: “A running coach is needed not necessarily for the physical preparation of the athlete, but for inspiration and support, and to provide an objective analysis of when the athlete is doing too much.” It is well-known that runners are a determined, hard-working, dedicated and often stubborn group of people. Sometimes they need to be told when to push hard and when to take it easy. It’s all about the checks and balances. I like how Franz Stampfl, a world-renowned athletics coach of the 20th century, puts it: “the coach’s job is 20% technical and 80% inspirational.” So, who needs a little inspiration? This entry was posted in Running Tips and tagged coach, coaching, inspiration, running, running coach, running knowledge, why a running coach.